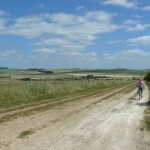 A select group – just Sue and I – took the train to Goring and headed up the ridgeway under a blue sky. 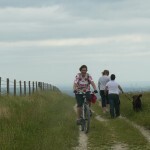 Front suspension makes rough tracks more comfortable and we were soon rewarded by wide views. 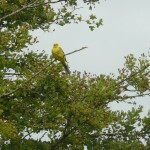 Two buzards watched our progress hungrily and a yellowhammer posed on a hawthorn bush. 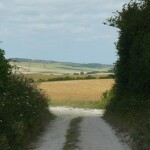 There were a variety of surfaces and only the final climb – six inches of sloping chalk ridge between foot-deep ruts – persuaded us to walk. 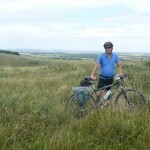 From Uffington Castle a steep road descent took us to the Wantage Road after which a marked cycle route led through time forgotten villages. Time was passing for us so we took a short cut to Didcot and the train home.